The Liturgy of Good Friday takes place at 3 p.m. with Collects, Passion, Prayers for the Church, Unveiling of the Cross, Veneration, and Mass of the Pre-Sanctified. At 7pm, the traditional procession of the Cristo Muerte takes place, with Bishop Frank Caggiano presiding. 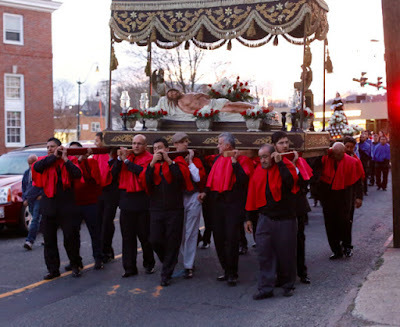 The procession is followed by Compline, the washing and anointing of the statue and shrouding with the funeral pall. Another all-night vigil takes place at the tomb until noon on Saturday.